ONCE AGAIN, a engineered part that may look similar to others on the market, but in reality is different when you look closely. 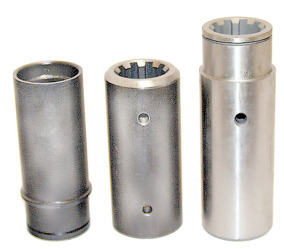 These CNC Machined Couplers are Heat Treated and Case Hardened in special fixtures to insure straightness, the whole point of a Coupler is that it must be absolutely straight and stronger than others. They are state of the art in all Motorsports applications. * Aluminum Couplers Have Limited Life Of 20-40 Races! !